The Academy announced future changes coming to the Oscars, including a new category and an earlier airdate in 2020. The Academy is changing the future of the Oscars. "We have heard from many of you about improvements needed to keep the Oscars and our Academy relevant in a changing world," Academy leaders said in a letter to members. "The Board of Governors took this charge seriously." Changes will include adding a new popular film category, moving up the ceremony date two weeks (starting in 2020) and planning "a more globally accessible, three-hour telecast." The Academy announced on Sept. 6 that it will not present a new category at its upcoming ceremony in 2019. "The Academy recognized that implementing any new award nine months into the year creates challenges for films that have already been released," the press release said. "The Board of Governors continues to be actively engaged in discussions, and will examine and seek additional input regarding this category." That line bolded above could easily be talking about the blockbuster, critical hit "The Black Panther," which Disney is aiming for Best Picture contention. Academy CEO Dawn Hudson added that further discussion is needed with Academy members before implementing such a big change. “We have made changes to the Oscars over the years—including this year—and we will continue to evolve while also respecting the incredible legacy of the last 90 years,” she said. The Academy also shared the news to its 3.2 million Twitter followers. Bailey was first elected president last year. Because of term limits, Bailey will have to leave the Board and thus his presidency next summer. The most recent category added to the Oscars was more than a decade ago. The Best Animated Feature category was created in September 2000 by the Board of Governors, which voted in December 2001 to present it for the first time in March 2002. Before that, the last time a new Academy Award category was established was in 1981, when the Makeup award was created. Other categories have been adjusted since then. In August of 2012, upon a recommendation from the Designers Branch (formerly known as the Art Directors Branch), the Art Direction award changed its name to Production Design. That same year, in June of 2012, the makeup category was changed to Makeup and Hairstyling. Key dates were announced in April for by the Academy its 91st Academy Awards season, leading up to the big day on February 24, 2019 — 200 days away. Those dates, including the ceremony, will not be effected. Nominations are set to be announced on Tuesday, January 22, 2019. The previously announced dates for the 92nd and 93rd Oscars presentations, however, were originally set for February 23, 2020, and February 28, 2021, respectively. This will be changing. 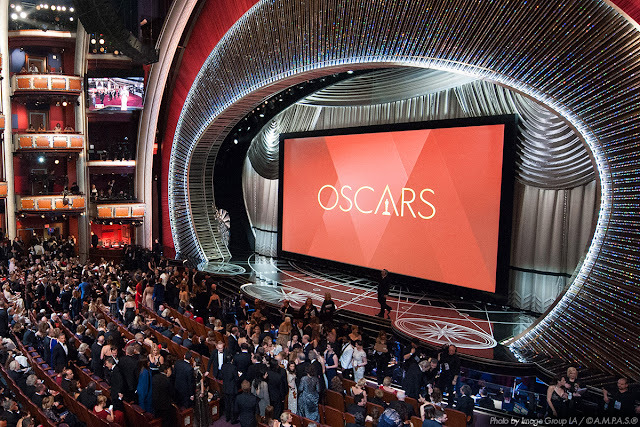 The 92nd Academy Awards will now move up two weeks to Sunday, February 9, 2020, the earliest date yet. No word yet on when nominations would be announced. With approximately 33 days in between nominations and the ceremony recently, that could put the nominations announcement tentatively on Tuesday, January 7, 2020. Nominations voting for next year will be open on Monday, January 7, 2019, for one week and then international accounting firm PricewaterhouseCoopers has another week to compile the results. If the Academy phases out the mail-in voting, it could in theory speed up the tabulating process. The Academy also affirmed the ceremony will stick to three hours in length by only presenting "select categories live, in the Dolby Theatre, during commercial breaks (categories to be determined). The winning moments will then be edited and aired later in the broadcast." In a follow-up Sept. 6 press release, the Academy provided more details about how the ceremony will be shortened going forward. Changes to the 91st Oscars (2019) include restructuring and shortening the length of the telecast to three hours. To honor all 24 award categories, six to eight categories will be presented live, in the Dolby Theatre, during commercial breaks. The winning moments will then be edited and aired later in the broadcast. Selected categories will be rotated each year. The Academy will collaborate with the show producer(s) to select these categories. The 91st Academy Awards, for outstanding film achievements of 2017, will be presented on Sunday, February 24, 2019, at the Dolby Theatre at Hollywood & Highland Center, and will be televised live on ABC and in more than 225 countries worldwide.